I'd like Mosley for MLB. Then not have to worry about lb in draft and focus on rb like Jacobs in early second instead of a lb. I'd love to grab verret at cb on a 4 yr deal to go with conley. Resign worley and let him and nelson man slot. I think you go after a tyrell Williams type big wr with some speed to counter jordy. Then u draft one early wr like Harris and grab a slot wr later. Like the thoughtful FA targets and we do have to be realistic in who we project to bring in. With that said, I'd definitely target a DE, maybe a well rounded DE rather than the flashy pass rusher like Lawrence, Ford or Clarke as they will command a Kings ransom. Flowers would be my top choice but if he gets resigned I'd look at a guy like Z Smith or maybe a guy like Robert Quinn could be cut and we could pick him up in the rotation. Howie's boy I'd also look at as a 1 year stop gap as I'm sure we'll draft a DE too and he could stand to learn a lot from a guy like Chris Long. At LB it was said often by better football brains than mine before the season that Whitehead might struggle in coverage and whilst he wasn't terrible (IMO) he's probably getting paid too much for what he brings. The coaches seem to like him so I'm sure he stays but I'd look to go with the young guys Morrow, Cabinda and Lee and add a vet like Avery Williamson to the mix with a couple rookies. I'd also add Jake Ryan as I think he could be a steal after his injury and was developing nicely. At CB I'd probably be the rarity in that I think I'd bring back Worley and Melvin and I'd also think about Hall too, I thought he did pretty well, is a well respected vet who is familiar with the DC and when the team was at it's worst he still played with heart and commitment - unless he retires of course. Conley looks like a bona fide shut down CB to me and while I'd like to try and upgrade overall with so many holes I'd be prepared to leave that and trust that the improvements in the front 7 helped the secondary as a whole. At safety I'd roll with Joseph and Harris and look to bring in a rookie or two but my big ticket FA would be Earl Thomas, he could have a Charles Woodson like effect galvanising the entire secondary for a couple years and he may not be that expensive given his age and recent injuries. Gilchrist I'd like to retain but only at a much discounted rate. At DE we need a well rounded guy as you said. Lawrence is a good all around DE IMO, while Z.Smith is just a pass rusher to me, so while I agree with your idea I don't agree here on these two guys with you Graham seems to be a guy, who can do both, but might not be that great of a fit with PG's scheme...Ansah could be a good fit IMO. At LB I'm pretty sure Tahir is back, since he got some guarantees already and Mayock recently talked him up a bit. He was a lot better in the second half of the season. He could be a servicable solution if we can upgrade the front 7 around him. Lee could be in the run for the SLB spot IMO, but ideally he is a ST first, run specialist second guy for us. Morrow and Cabinda showed some promise, but I would like to see us going for a more sure solution if possible. Jordan Hicks is maybe the only guy I would welcome as a FA, since he would be a pretty good value signing IMO. We should target LB's early in the draft, a guy who can cover well, would be a big help. At CB I doubt Melvin would come back after his mid season twitter rant. Worley is a no brainer on a tender, Conley is a lock. We need a guy to push Worley for the #2 IMO, a veteran would make more sense IMO, because of the instant effect and then we can add a rookie or two down the line. Dennard is an obvious solution with his ties to PG IMO. At S I think Karl is a solid option as a starter, but I wouldn't hand Harris such a job. I would welcome a veteran and then draft a guy like Adderley relatively early. Harris would be an ST ace and capable depth, while Karl-vet-rookie would be a strong trio. I'm still not sure about Guenther and the fluid unit thing. Last season he moved Hurst a bit to 4-5tech and he used McDonald there too, but that's it. If he gets more quality players he could go either way IMO. He could use them in an even more fixed way, if he has a solid/good player for each spot or he can start to mix and match when he has more solid/good and versatile guys. The FA and the draft should help us guessing. I mean if we get a guy like Gary who seems like an early down DE, rush down DT we might just see the direction there. If we get a smaller DE, who is EDGE only, then again we can see the direction better IMO. At DE we need a veteran and a top rookie and maybe another one later on to battle Calhoun for the final spot. It will be interesting to see, where we go in FA. Will we bring in a bigger DE, the likes of Dunlap, Johnson or a smaller, quicker guy...Brandon Graham seems like a good fit if we go with the smaller DE. Ezekiel Ansah could be an interesting wild card IMO. He had some injuries, so his price should be low, but from a fit perspective I think he is a prototype PG DE. Has the size, the power and can play the pass and the run. There would be an injury risk with him for sure, but the reward could be big too. I don't think you understand what I'm getting at. When you look at the best DL in the league, they move guys around quite a bit. I'm not sure if Guenther will do it, but on a team that was pitiful in sacks, I wouldn't worry so much about position on the DL, especially with versatile guys. Mccoy himself recently went on twitter and said he can play every position on the DL. We played hurst at edge at times last year to try to generate pressure. Look where hurst lines up at 2:36. That's certainly wider than a 4 or 5 tech. Jackson can play up and down the DL as well. I understand how you're looking at this, but also understand that the coaching staff will be looking for the best players available on the DL and finding fits will be secondary. Which is why I'll put my house on the fact that they won't pass on Quinnen Williams, even if Josh Allen may be available. Williams could be a dominating defensive end in a 4-3, even if it's not his ideal position. I'm 100% against this line of thinking. It's one thing to put current players in a position of need, but you should never draft or sign a guy if they don't fit what you're trying to do. This never works. Even great players never become what they could have been and typically leave after their rookie deals to go play for a scheme fit. I get what you say man! I want a deep DL with good rotation, but I want DE's, DT's, NT's to play their roles and play them well. I don't really want a solid DE, who can rush from the inside too. I want DEs who can play the run, can bring the pressure from the outside, then I want DTs who can play the run and can bring the pressure from the inside. When you don't have a complete roster you start to move guys, you start to be creative, but IMO it is not the goal. Hurst as a DE was weaker as Hurst as a DT for example. You don't want to use him outside really, but you have to if you don't have enough (quality, quantity) edge guys. Sure, I don't disagree. Sometimes I think a player transcends positional value though. Quinnen Williams is that guy for me. He'll transform this defense IMO. I believe White would also have the same effect on our D. I do not like the idea of drafting a MLB top ten but if we believe he is capable of transforming our defense and giving it an identity like Ray Lewis, Patrick Willis, or Brian Urlacher then I am fine with it. I think we would get no less than a more athletic Luke Kuechly. Fact is, you better have LBs who can run and cover in today's NFL. Especially in the AFC West when you matchup against offenses like KC and LA. I look at the draft like this.... 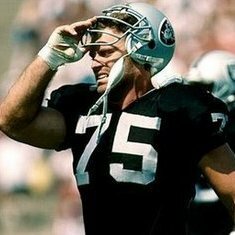 The Raiders need a combination of Edge, LB, Skill, DB. How they do that with their first 4 picks is irrelevant as long as they hit those positions. Yep, I agree Lawrence is a great all round DE and perhaps I wasn’t totally clear in that I don’t think we’ll pay top dollar for one of the bigger names like Lawrence (or Frank Clark) as we might as well have payed Mack if we’re going to give him 20 mil. Z Smith on the other hand I feel can be a good all round DE for us (projection of course at this point) and we’ll likely get him for a much more economic amount. Flowers would be my top target providing he didn’t command too much and then I’d agree Graham or Ansah could be decent value short term guys also. I also think Howie's boy Chris could be a good 1 year vet to help bring along guys like Key as he still looks like he can play at a high level. This is the most importantthing this off season for me, to upgrade the DL as everything else on D is dependant on it. What do you guys think about PJ Hall as a long-term piece in our defense? One of the problems is that it's a very weak year for LBs. After White, Bush, and Mack there really aren't any good prospects. I like Hanks out of NMSU but he looks like a project. I actually think his ceiling is quite high. The guy has very heavy hands and some time in a strength program along with a DL coach who can develop his hands could turn him into a dangerous player. I think his floor isn't very high though because he's still quite raw. He was a late 2nd, closer to a 3rd so I think he's right in line with where he should be developmentally.